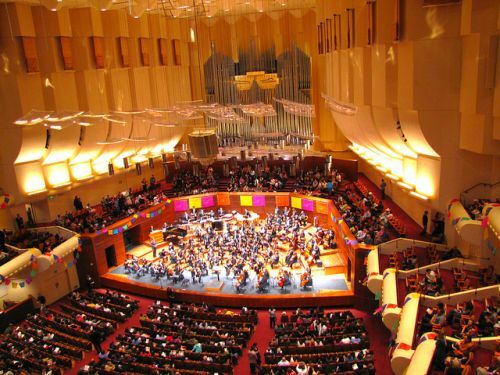 San Francisco has an excellent symphony orchestra, with Michael Tilson Thomas (MTT) as the principal conductor. San Francisco has an excellent symphony orchestra, with Michael Tilson Thomas (MTT) as the principal conductor. The Season goes from September to April, with a break in the middle of December and January. When the San Francisco Symphony is on tour, other orchestras visit to fill the void. In July there is a 'Summer in the City' program of light music; August is quiet. Opened in 1980, the building's sweeping wraparound architecture was elegantly designed to compliment the other buildings in the War Memorial complex. Inside, the building was designed to maximize acoustical tones with the exterior glass wall being used as a backdrop to capture sound. To further enhance and refine the sound it has adjustable acrylic acoustical panels around the stage area.